Its painted in the striking Kona Blue, with a Stone colored cloth interior. This is a standard V6 with the appearance package, so its affordable and stylish. Under the hood breathes Ford's wicked 300hp all aluminum V6 engine. A 3.7 liter DOHC 24 valve V6 with variable cam timing that will push you back in the seat with authority and still net you about 19-city/31-hwy. Very respectable for a 305hp 280lb/ft sports car that costs a bit over $21K. 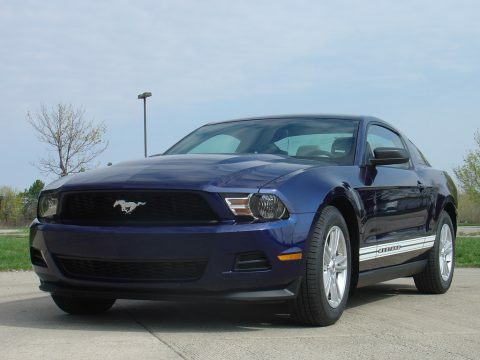 -The only option on this Mustang is the appearance package. Which gets you the lower graphic stripe and the trunk lid spoiler. These are a few of the standard features. -Cloth bucket front seats with 4 way manual adjustments. -Leather wrapped steering wheel with speed and audio controls. -17" painted alloys and a really good looking wheel, if I do say so myself. -Sequential tail lamps so the turn signals illuminate from inboard to out in sequence. -The Easy Fuel capless fuel filler which is hard to get used to. I still feel like there is a cap missing when I gas up, but I understand that it automatically seals shut to prevent evaporative emissions and it won't open without the right fittings. -Fords special traction control and electronic stability control system is standard on all new Mustangs. -Dual front airbags as well as driver and passenger, side impact airbags. -Remote keyless entry and a passive anti-theft system. -The effortless steering is provided by a very positive feeling leather wrapped steering wheel and Fords new Electronic Power Steering (EPAS) Which changes feedback and adjusts the effort required to steer according to the vehicle speed. As well as giving better fuel economy by not having to turn a horsepower robbing, hydraulic steering pump. A pretty sweet ride for the money and good gas mileage considering the price of gasoline these days. The perfect compromise for sporty economic fun.